We get by with a little help from our friends. And my friends are helping us all with their new book. 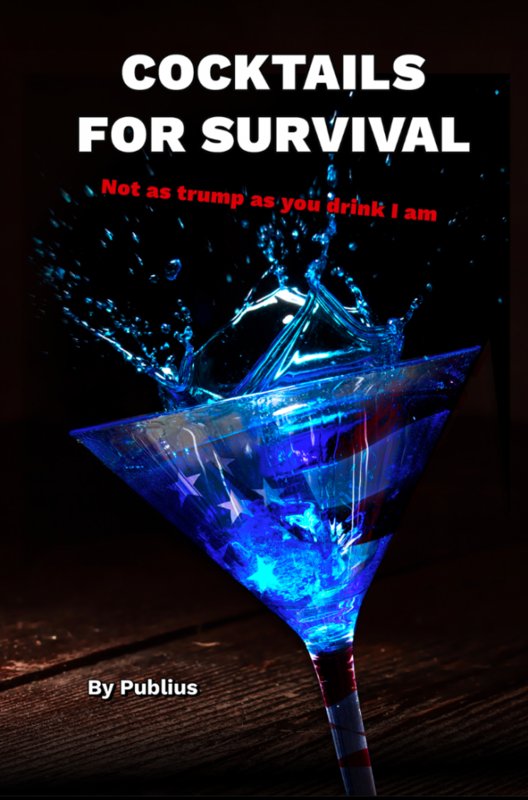 Cocktails for Survival: Not as trump as you drink I am is out today on Amazon.com. Drunk Publius was born under a waning gibbous moon on a balmy November day. Created from the tears of Madison, the dulcet tones of Hamilton, something coughed up by John Jay during an illness, and a generous helping of alcohol, the spirit of Mr. Publius is rumored to stagger out of the fields of the Midwest to protect and mock the Republic when its voters prove to be idiots. If things get really serious, he can merge with Johnny Appleseed, Paul Bunyan, Casey Jones, and Pecos Bill to form a Voltron robot to protect the nation from enemies foreign and domestic. When not mixing drinks or responding to an existential crisis in America, Drunk Publius enjoys traveling, listening to records, and wrestling bears. There are 50 drink recipes. Try a new drink recipe each week of the year with two weeks off for unconsciousness. Repeat 4 times and it will be over. Get your copy now! It’s going to be a long 4 years.